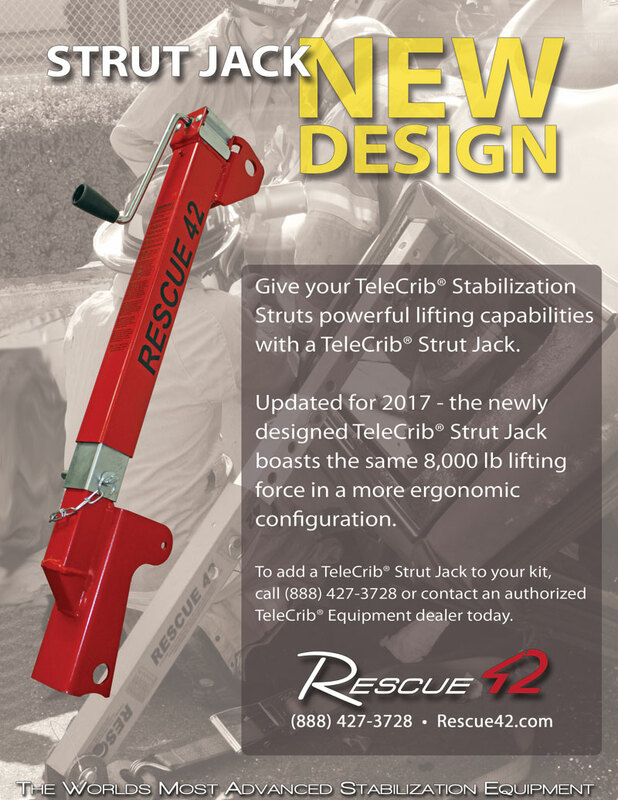 NEW DESIGN: A removable 8,000 lb jack which fits over the strut body and gives the rescuer a controlled means for lifting or lowering a load. The Jack has a 15″ range, but can be used to raise or lower the entire extension of both strut sizes by pinning the strut and resetting the jack. Because it is removable, it can be moved from strut to strut as needed, minimizing storage requirements, cost and kit weight. Use for lifting operations or to effectively crib behind an airbag lift. See video for more information. 1″ diameter x 4′ long x 1 ¾” head – Good to use when other anchor systems are not available. Can be driven through picket holes in the TeleCrib® strut baseplate to secure struts to the ground. 3/8″ x 20′, grade 70 with grab hooks at both ends, 6,600 lb working load. TeleCrib® combi-heads are designed with a 3/8″ chain slot to use with chain saddling techniques. Perfect for securing struts to any compartment surface or pullout tray. 2 per set.